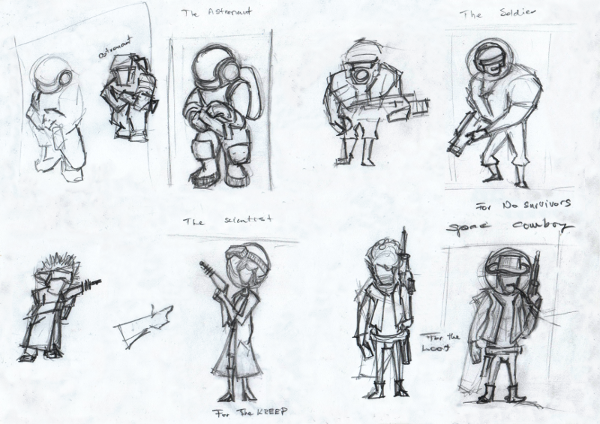 TIGSource Forums Community DevLogs KREEP - Steam! 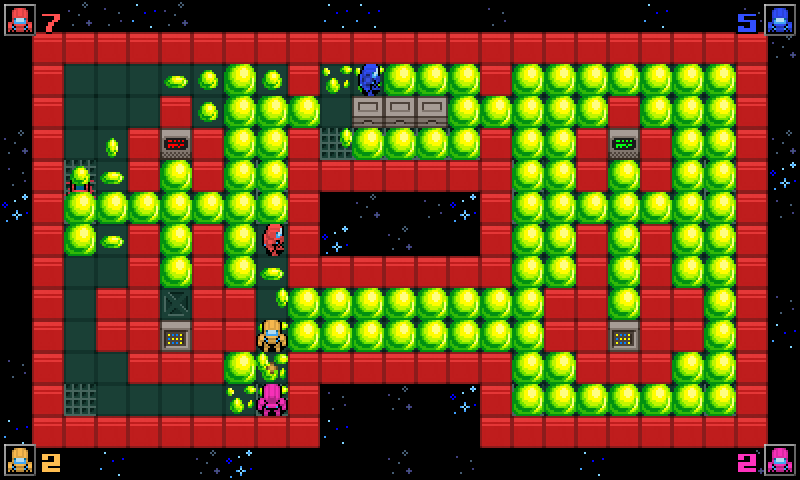 KREEP is a two-dimensional top-down couch co-op (hot-seat) multiplayer action game. Similar lately popular ones, that I should mention, are TowerFall and Samurai Gunn, but it is actually more akin to older games in design and mechanics. The most influential games putting their stamps on it were Battle City and Dyna Blaster. 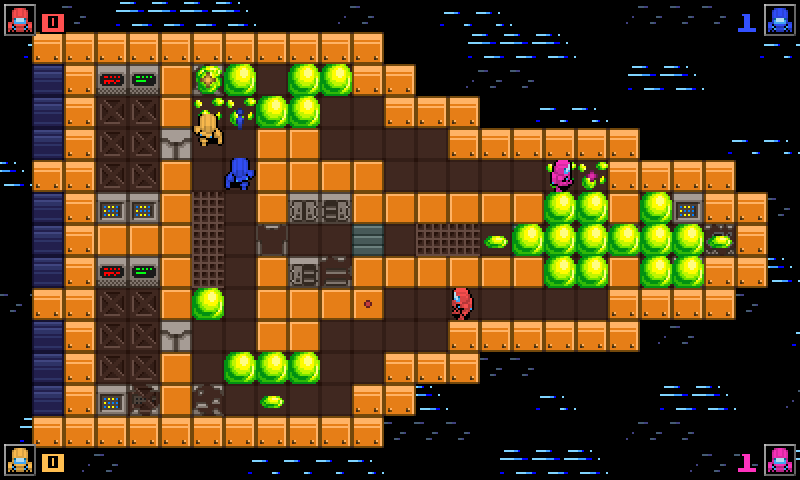 The core mechanic and main story element (or simply the antagonist) is the "KREEP", a tirelessly ever growing alien life-form which actually "consumes" the free walk-able tiles on the maps while playing a deathmatch. The main goal of each player is of course to frag the others and get the most points, but the KREEP twists the gameplay, as it is an artificial time limit and it transforms the play area while playing a match. Development started around two months ago. First I started with completing a fully functional prototype which included all the main mechanics to be able to play a test match with my friends and verify whether the core experience is fun before going into full-blown production. This prototype was ready after a month and based on the initial tests, I can say, that the game is a lot of a fun to play together. Some rough edges have to be addressed, but I decided to carry out this design, finalize it in the upcoming weeks and start making a complete experience out of it. Currently I'm producing the assets (mostly tiles, sprites and maps) for the game and still experimenting with some design ideas, new rules and new gameplay elements, but the core design is starting take its final form. I'm planning to complete the game by the end of September, but I'm pretty sure a public beta version will be completed before the end of summer. Until than, I'll do my best to post and update at least once a week (or more often if something fancy is completed ) about the status of the development and to share some screenshots and gifs. Bear in mind, that many graphical elements are still place-holders or open art assets. These shots do not accurately represent the final look of the game! Nice! Like the graphics, especially the player character. Thanks Bahototh and hi again everyone! Since the major programming tasks got out of the way in the first phase of development, last week were and the upcoming weeks will be about content. I've been mostly working on tile assets. I've settled on the main graphical style a while ago, so been mostly cranking out individual tile assets, color palettes, and some tile animations. Progress was kind-of steady, slowly advancing towards a final core tile set and an overall map look and feel. I'm shooting for a retro pixel art feel, but to further define this, I'm trying to make it look like a "turn based blocky/grid-based roguelike". 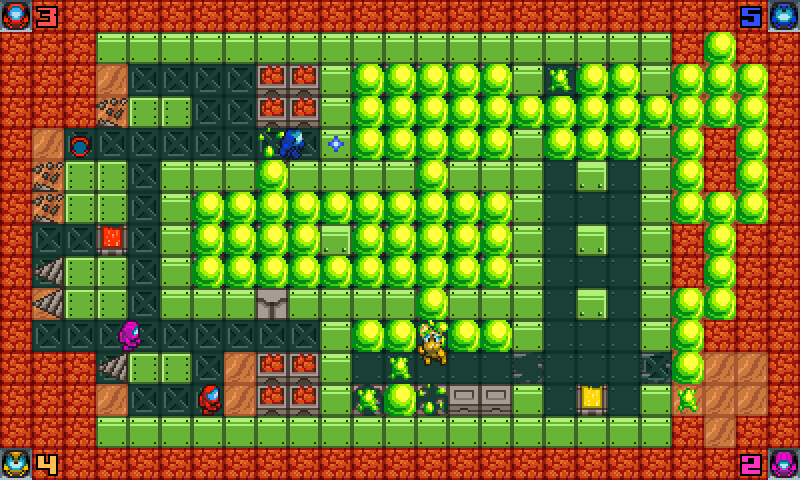 I know the game is a real time sci-fi action shooter , but since the map and movement is discrete (you can only move a full tile, like in Pac-Man or in many roguelikes), I wanted to achieve a look which suggests this to the player and the whole grid is easy to read while playing. Hence when creating a tile I simply start from the same base (a 3 colored "panel" with a one-pixel wide dark border and even darker four corners) and with tiny modification and by searching for a good 3 or 4 color palette, I push pixels until I find it pleasant looking . If I find some colors fitting a tile well, I copy all the good-looking existing tiles and apply the colors to them. This could somewhat be achieved with color tinting when rendering the sprites, but I think that route does not allow good enough control over the final look! The player colors are done with tinting on the last screenshots and I'm totally not satisfied with the results, so that is going change sooner or later too! By the end of next I week, I will have a close to finished tile set for most of the levels (maybe some extras will still be missing but not much). I will try to put together some sample levels more representative of the final map designs. Cool stuff, I like it! I just wonder how you're going to do the multiplayer, code wise? Are you using a multiplayer service? Or steam or something? I forgot to tell, that I would not like to take credit for the player character graphics on the first screenshots ! They will be swapped out later on! Well, about multiplayer: not the best option on PC, but only hot-seat will be supported. Four players at the keyboard or four Xinput controllers (and mix & match of course). Four friends + Towerfall / Samurai Gunn + four controllers + smack-talk == sweetness ! Yeah local multiplayer is the best. Looking forward to seeing this as it develops! Really cool idea to have the environment be the time limit, akin to Towerfall's fog I guess. First and foremost, I've implemented breakable props and added graphics for them. 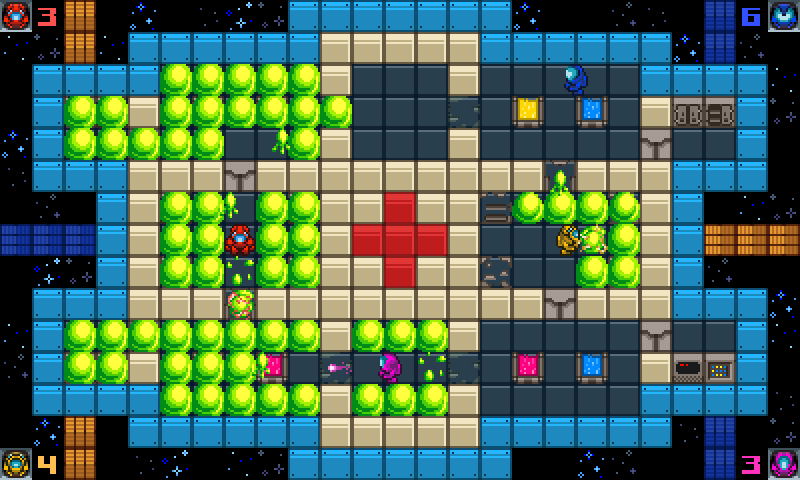 From now on the tile map is multi-layered, props reside on a different layer on top of the "base" tile map, but they still collide with the entities of the world. 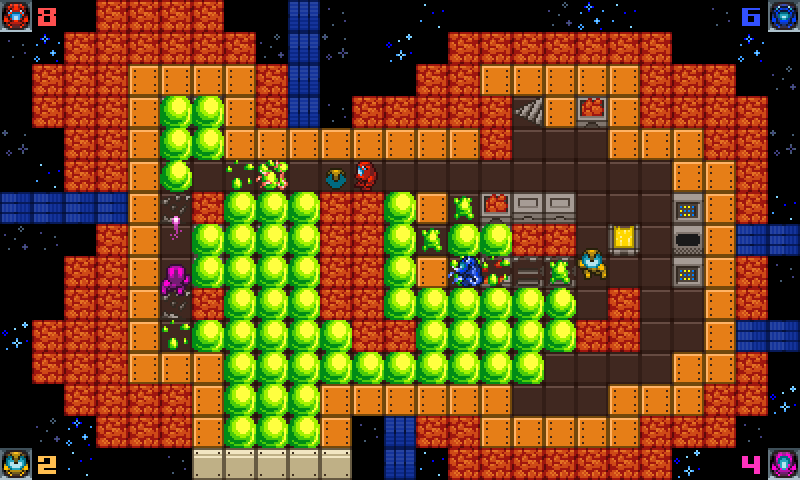 The KREEP and lasers break the props, swapping their graphic and disabling their collision. The other bigger task completed is doors. Doors will also influence game-play and map design just as much as props, since they are indestructible, but can be passed/opened any time by the players and the KREEP. The same way as the last two weeks, been working a little on tiles too. Here is a new experimental map featuring some new tiles. Warning totally WIP! The final feature set is starting to take shape, so next week may be more about implementing missing entities and rules, than about new content, but I will try to take nice GIFs and screenshots too and I'll make sure to write down my findings about a recent private test session with my friends. That new map reminds me a lot of the first FTL ship! The doors seem like a cool idea and destructible terrain too. Will there be any destructible objects that damage enemies/kreep? That new map reminds me a lot of the first FTL ship! From the beginning, I've been planning to have maps resembling spaceships. I think this map design looks cool . The doors seem like a cool idea and destructible terrain too. Will there be any destructible objects that damage enemies/kreep? Thx, and yes, I have an "extras" part between the tasks, and it contains the idea of "trap tiles", which players can't touch, or get electrocuted or something like that, but sadly I think about the "extras" part as disposable, so if I run out from my planned project time, I may leave those features out . A small update now, but planning to do a big one by the end of the week. This is just a warm-up for the new player character graphics . 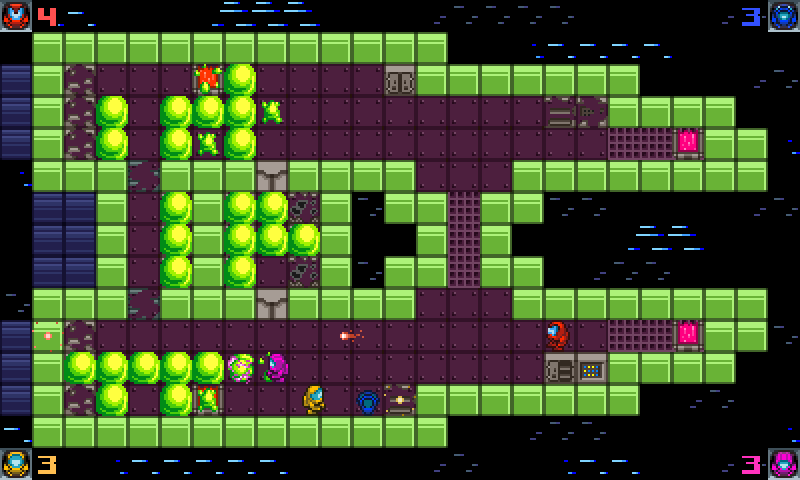 As I have mentioned last time, we made a test play with my friends, but hastily I implemented teleporting before it . This feature looked really cool, while I was making and testing it, but it somewhat contributed to the "much less fun test session, than the last one" . Due to these features added lately (destructible props, doors, teleporters) the maps became a bit noisy and chaotic. Some players always lost the track of their characters when they used it regardless of the color-coding. I think this could be helped out with some audio-visuals, maybe some particles or something similar around the used gates, and some louder, more memorable sound (can't help it, this comes to my mind: Doom, what a cool sound and effect ). The other problem which made play-time less enjoyable was the KREEP progression. I amplified it's power a little just before testing, because my main intention is to limit a match time as much as possible to around one or maximum two minutes. This backfired a bit :D. We were tore to shreds in half a minute every time, and literally could not stop it. Since than, I've implemented a configuration system, to fine control it's spawn time speed-up/down over time. With the new curve it is much much better, but still needs a little work. The base configuration can be overridden on a per-level basis, so if it does not work out for smaller levels I'll be able to band-aid it. That's it for now. Next time I'll present the new player graphics and will talk about the future plans with the game. As mentioned last time, player graphics! Than I scraped the whole idea of distinctive characters, because lately I realized a couple of things about my goals and the core design and plot. The simple reasons are effort and graphical style. It would've taken a lot of time to really polish these portraits, and the top-down view is really restrictive in this regard, so it would have been impossible to keep the player coloring mechanic (anyone can select any look and your player number defines your color tint) and achieve recognisable game-play character graphics. The other not so obvious reason is, that in this game, players take a similar role and from time to time work together and not only against each other. Based on the back story, you fight the KREEP on places and in a setting like the Nostromo from Alien, and you get to choose while playing if you are Ripley fighting for survival or Ash the android helping evil corporate goals (and of course infuriating fellow players ). I believe similar looking and more generic characters fit the whole theme much better. Another thing is that I really liked the place-holder character I've used in the game so far . The down-side with this approach was, that players don't get to choose from various looks, and I kind of missed that idea, so I came up with a direction, that somewhat brings good traits from both worlds. The player characters would have two sprite layers and the second layer can be selected by the players to customize the head and armor looks. 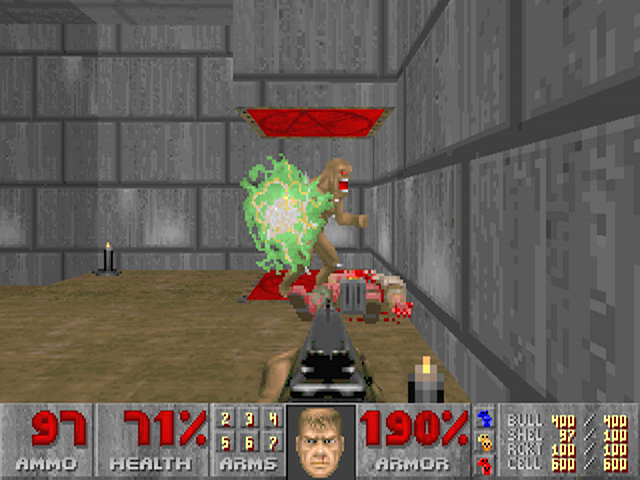 This amount of graphics to be produced was absolutely manageable, and it allowed a small customization while keeping a similar but recognisable look with player graphic coloring. I'm perfectly satisfied with the new player character graphics. I'm pursuing this direction and I think overall, it benefits the game the most. I would like to get the game, when it's finished, to steam. So I'm going to put together a greenlight page by next week. I don't know how much time I will have besides working on it, but I still have some half-finished developments sitting on my disk and I'm going to post the page itself, so at least a gameplay video is to be expected ! You should make a way to be exposed to the vacuum of space and sucked into nothingness! Maybe like a special goody that's in the airlock but is dangerous to grab since some one might the hatch. While I was preparing my greenlight page material, I realized, that I did not share anything about the KREEP itself so far. At least visually not much. What a shame, it is kind of a main character (antagonist), should deserve more from me . 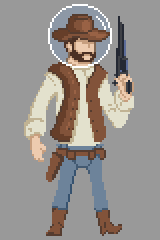 Also lately I had some tweaks in its palette and animations so it kind of reached its final-ish state. This was captured right after starting a test level with two players. Only mentioning this because, both the player count and the size of the devoured place (+ passed time) influence the spawn speed and the number of simultaneously occupied tiles. A deep space medical station. What tech do you use for multi-play? Great dev log and a fun looking game. Keep on keeping on and best of luck! Sadly no game-play video still. It is a bit of an amateurish thing, but I totally underestimated the time it takes to put together a nicely prepared teaser video with game-play footage (silly me ). It is actually near completion, just minor fine-tuning and a final render is required so expected arrival is within one or two days, but will not rush it! I felt a bit glum because of this thing so I really wanted to post an update at least with some new screenshots and my newly learned words of wisdom: Do not underestimate the time it takes to capture cool game-play footage and editing it aesthetically, especially if it is your first time doing it! No, a few afternoons is not going to be "totally enough". Again, silly me being captain obvious here . A mining colony on a Mars-like planet. An asteroid mining station. Put this together using existing tiles only, but I may change the "rock" tiles to a new one, since I'm not totally satisfied with the final composition. Thanks, really cool game and dev. log. you have there too with Boss 101 ! I think lurking around on tig for so long made me appreciate game development blogs so much, that I joined and I'm really enjoying it ! 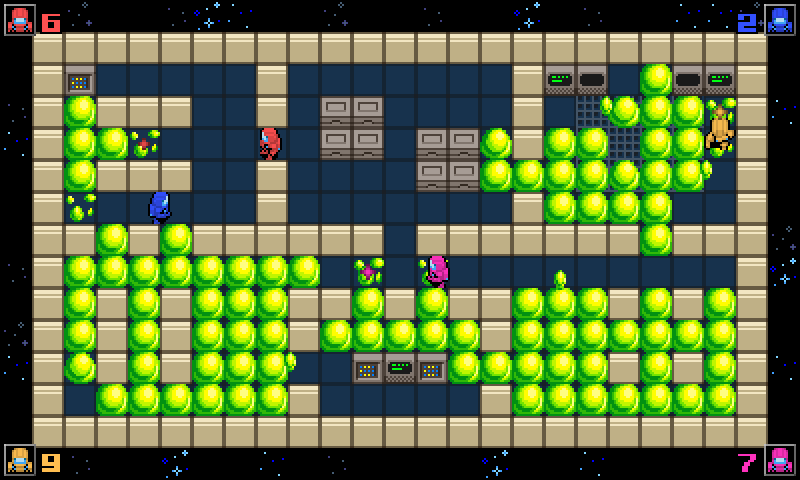 If you liked Bomberman, I'm sure you are going to enjoy this one . It is a bit more chaotic and faster, but it certainly has a similar vibe. I took some time off from development. Both my fiancee, my dad and I had our birthday last weekend so it was loooong . But it's finally here, I've published the greenlight page for "Operation KREEP". Fingers crossed! Please check it out and if you like what you see drop a thumbs up . If you do not have a steam account or if you are not a fan of greenlight, I would still like to present the teaser video, because producing it took a lot of blood, sweat and tears, and I'm really proud of it. At least even though being my first gameplay/teaser video I think it became pretty cool. Check it out and share it with your friends if you happen to have the same opinion. As you can guess, I haven't advanced too much since my last post. I've started developing the last larger feature, the game rule mutators, but it is not yet in a presentable state. Next week if time allows I will have their design finalized and maybe some nice GIFs and screenshots of them in action too. As mentioned in the short description of the game in the early days, game rule mutators were planned to spice up the gameplay. I got half-way through implementing and fine-tuning them (currently nine mutators are planned for the final version), so I thought they are ready for an early look! Since these are more complex features they deserved to be showcased in a video format. Only two is described in the video in detail (and a third one hidden in there ), but the others are similar in their complexity and game-changing effect. The idea behind them is not a biggie: instead of "game modes" I thought having complex game-rule variants and allowing all of them to be active at the same time could lead to more "fun". A flexible skeleton code is ready too for easily adding more mutators as I go. Free from one shot one death, the personal energy shield saves each player from one hit. Killing KREEP speeds up your weapon for a time. Greenlight is going slowly but steadily, but other everyday-life factors take a lot of my time too lately. Will try to grind my way for the demo version in the upcoming weeks. Good luck with your Greenlight campaign. You've got my vote.